I've had a break this holiday season. I've used it to re-arrange my crafting room. This time, I nabbed a free class from Scrapbook.com called Get Organized. It's a 27 week class that I intended to tackle in a weekend. Well, it's been about 10 days and I'm not quite done (but close!). I've gotten all kinds of attractive storage as my Christmas gifts. Here's a sneak peek at what I got from Home Outfitters. I used one expandable just as is and another in (what I think is) an innovative way. You'll spot these under shelf baskets in my new room in a jiffy. Bet you'll be surprised how I used these stacking pantry baskets! What are your guesses? How would you use these in your space? For no particular reason, my sister decided to make a wreath for me! She gathered all the stuff at Michaels Craft Store when they had their Black Friday deals and put it all together. She gave it to me when we went for a family skate. She scented it with pine too. I'm not fond of the smell, but the wreath is outside, so it's okay! It's got poinsettias and pine cones, holly berries, and a glitter-tipped, white, wintery, butterfly. It's not a big wreath, but it's pretty. We usually decorate the exterior of the house for Halloween, but we do very little for Christmas (just lights). So, this was a much needed holiday decor injection! We were kept up with the ice on the trees in the conservation area breaking off the branches. The damage is so sad to see this morning. The freezing rain has stopped but high winds are expected. We fear that when the surviving ice-laden branches start swaying in the wind, we're going hear a lot more branches cracking and crashing down. The news says many are without power. Our power lines are underground, so we have been spared (phew!) I hope we get a few days of warm up to melt some of this ice! Some snowman decor I made was nabbed and highlighted as a sample on the Accucut Craft Facebook page! I don't have a Facebook account myself. You can read about my holiday snowman decor in an earlier blog post. Accucut Craft has a Black Friday sale, so you too can own the die cut I used to make these snow people! I followed this design and made two monochromatic versions: one blue and one red. The red and white one I am submitting to the Kards for Kids drive as one of their colour challenges. I'm going to send along the blue one too. I just drew the ribbons on myself. I am quite happy with how this Christmas card turned out! I can imagine it in all colour pallets, even black and white could look nice. Sometimes it's great to craft with others to get inspired in unexpected ways! Claire's "Winter Cheer" snowman card is quite cute and I think it was the first one she finished. 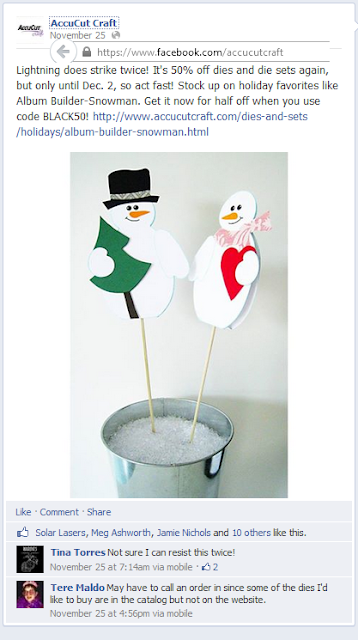 The felt snowman is adorable and mounted on a shimmery paper. Debbie's "Joy" card features the lovely little Christmas tree stamp that I picked up at the Michaels Craft Store not long ago. She used a snowflake embossing folder (by Darice) in the background. I think this card is very well balanced. Lara was using cards from Studio G. that had a scalloped edge, so she had a little less room on the card front to work with. No matter, this simple but graphically impressive reindeer card takes care of that! I like the clever framing of the sentiment around the ribbon tail background. One of two new additions to the Creative Crew, Monika put a lot of effort into the design of this Christmas ornament card. She used die cutting, punching and heat embossing to make this card. (Methinks I have a fellow tool junkie in the making!) I think that keeping the colour scheme simple on this card combines perfectly with the intricate background paper. My other new addition to the Creative Crew for this workshop is Nicole. She was the brave one to make her "happy Holidays" sentiment the focal part of the card. It's something I've often thought about but have yet to accomplish! The bling on this card brings out the shine in the metallic ink used on the sentiment. It's important to bring that sentiment to the eye when it doubles as the focal and she did a great job of it. Speaking of bling... Norma really blinged it up on this Penguin card! She used a black and white paper and them framed her penguin on silver glitter paper. The snowflakes on the patterned paper really burst when paired with the glitter frame and using red instead of white in the middle creates the Christmassy feel! I guess mother and daughter think alike! Like her mother, Norma, Terri-Lynn's penguin card also uses glitter and reds to make her design pop. Her "Merry Christmas" card is a stunning red and white classic. I think the layers on this card definitely add to the interest. I got to introduce new people to my paper fanatics! I was inspired to make something new - more on that in a future post! There you have it: seven very different holiday cards all made from the same basic starting designs. I hope these handmade cards inspire you to get in gear and start crafting your Christmas! Today, I am sharing another Christmas card I made for for the children at Toronto's Sick Kids Hospital as part of the Smiley Team for Kards for Kids. I had to go to the Michaels Craft Store to pick something up for a specific project. Since when do I go to Michaels for something specific and not also look at EVERything else and pick up 3x the items I originally went for? Yeah. The Black & White Challenge is from this inspirational photo. I kept with the black and white theme and thought my new tree would be perfect since there are also trees in the inspiration photo! I didn't put a sentiment on this one so that it's not strictly the religious version of Christmas. I tried something that's been on my technique bucket list for a while. I followed a tutorial from Gina K. Designs for the pillow top stamped background. The inner background is a stamp from Stampin' Up! The tree is the stamp I got on the cheap at Michaels. I stamped it right over the words in Versamark ink and then used black embossing powder. I used a black card base from Michaels I picked up on a previous trip. I didn't realize I had grabbed a package without envelopes. (That explains the great price! lol!) Michaels' cards are not true standard sizes. This one was 4.5 x 6.25 inches. So, all I did was trim it down to 4.25 x 5.5 inches and then it will fit in any of my A2 envelopes. I really liked how this designed turned out, so I tried it several different ways on some shaker cards. (I'll post those at a later date.) I hope you'll play along with the Kards for Kids Holiday Card Challenge! We had a costume contest and a pumpkin decorating contest at work on Halloween this year. We had a decent number of people dress up. I have two costumes that I alternate wearing when I give out candy: my demoness (favourite!) and my witch. My witch hat doesn't fit, so I needed to get another. I got one on sale today at Target for $0.90!! It's a little too big but I can stuff something in the rim to make it sit better. It's only plain, so we'll see if I feel like getting some felt and netting next year to dress it up. Justin is already a tall guy so the mask made him very very tall. Some smaller children were afraid to approach him (also not knowing who the character is). Small children are sometimes afraid to approach with my wings and fangs too. My husband doesn't give out candy - it's my job. He did take our nephew out and around the neighbourhood though and he dressed up in his camouflage. Our nephew was a red ninja this year. Our nephews in a neighbouring city were a red army guy and a little lion, so I'm told. Hope everyone had an enjoyable Halloween! Now, on to Christmas! It's another hand made Christmas card challenge creation here today. This one is for a pink Christmas. This card for for the children at Toronto's Hospital for Sick Children. Sweet, huh? I used my the Sweet Shop house from my Close to My Heart stamp set and coloured it all pink! I framed it on an Accucut Craft frame die and also used my new Accucut Craft mini ornament die on some old Bazzill "Swiss dot" embossed cardstock. The Christmas in July card drive for the Sick Kids hospital raised 904 cards, 3 card kits and 20 notebooks for the parents! The latest card delivery to the hospital were the not-so-spooky Halloween cards: 566 of them! There were also items for the kids' treasure box and notepads for the parents. If you are playing along with this holiday card drive, be ready to ship your cards to Bela by the end of November for delivery in early December. A while back, I made a robot card from paper scraps. I decided to repeat that design, but I used thinner scraps. This time, I didn't use a focal image. I used die cut dragonflies (from Accucut Craft) on this card layout from scraps. I was quite pleased with how it turned out. I made a few until I had run through a decent amount of scraps. I corner punched this one on one side and I think that made it look a little classier or at least added some more interest. When I was working on my wedding album for the crafting week I took last month, I found a scrap from the wedding mini album I had made for a co-worker. It fit the picture I was scrapbooking perfectly in size. I took that as a sign that I should find more scraps. I repeated the layout from the card and all the scraps came from the wedding mini album I had done. I am so pleased with how it turned out. The top of the arch was a little boring, so I need to find something for it. I didn't have a doily quite the right size, but I had this stamp set my sister had given me. She accidentally bought two and gave me the extra set. There's a flower that looks like a lotus flower in it and it fit so nicely at the top. It looks a bit like a crown! I embossed it in black to help it stand out from the pattern. Slowly but surely (very very slowly! ), this wedding album will get done! Today is your seventh wedding anniversary (although we have been together for 18 years). I borrowed a stamp from my sister. I knew I wanted it when I saw it in the Close to My Heart catalogue but my sister bought it, so I didn't have to. I've been trying to think of ways to use black more as a base for cards. I knew I wanted to use dark colours for this one to try and make the red really pop. (My red ink is not the strongest though... maybe I should have embossed it. Oh well!) I do like how it turned out. I really wanted this love-based card to not be frilly and girly. I used some scraps from the two wedding albums I've worked on recently (one being mine - yes - STILL - after 7 years!) I based this card on a sketch (but I can't find it now). My husband is a definite keeper! He's always thinking of me first - all day every day. He has triple the energy I do - works all day (often more hours than I do) and does a lot more around the house than I do. He takes extremely good care of me. We are total opposites in all the little details but similar at heart in the ways that matter. Our divergent details help us to balance each other out. Without him, I would be completely off-kilter! I do truly adore him! I used three purple inks on this card and the purple paper is from DCWV (a stack I nabbed at Homesense for a great price). It was quite enjoyable stamping the snowflakes wherever I felt like it. There was no precision needed. I didn't want to cover the sentiment, but I could have stamped right over it and have snowflakes overlapping. They do that when they are falling anyway! The sentiment is from Stampin' Up! If you would like to learn more about this technique, Gina K. Designs has a done great tutorial recently on background stamping with snowflakes. One challenge down - at least 4 more to go! So, my sister asked me to attend a free Copic Marker demo at a Michaels crafting super store this weekend. I have a decent number of Copics, but I have never taken any particular Copic colouring classes, although I have watched many useful tutorials online. Last weekend, we had a Holiday Card class with Close to My Heart and we made this really cute village scene to learn the technique of masking. Well, I wasn't planning on buying any Copics, but my eyeball happened to fall on a colour that was just like the colour we used on the holiday village (which is a stamp set I bought too)! The Copics were on sale as well, soooo.... I had to buy it. And then.... I had to buy it a friend so I could blend too. It's clean and simple, which is right up my alley! I used a digital fairy image from A Day for Daisies (which is no longer available). The Copic colours BG72 "Ice Ocean" was the colour I had to buy and BG10 "Cool Shadow" is the friend I bought for it. Now, the demonstrator at Michaels said she was told to use the dark colour first and then go back in with the lighter colours to blend. I am used to starting light and slowly darkening an image. So, that's how I do it. I colour all over in the lighter colours first, leaving white where I want pure highlights (none in this case). Then, I dab in some shadows and then I go back with the light marker to blend in that darker colour. For this one, though, I tried it the other way: dark first and light after. I left white when colouring with the darker marker for where I wanted the lightest highlights. I found I had to go back over it a lot more than with my normal method in order to not have such a stark contrast where one colour ended and the other started. But it still worked. Personally, since these markers blend so well, I think it would work either way. Here is the card we made last week. The roof of the building in the middle is the colour I wanted to match. It's actually a very close match! The colour I got has a little more grey undertone than the CTMH one. The CTMH one has a little more green undertone. You can't see the difference with the photo very well, but I can see it with my naked eye. I had fun playing with my new markers. I love blues and teals! I just had my annual crafting long weekend (which extends through the week for me). 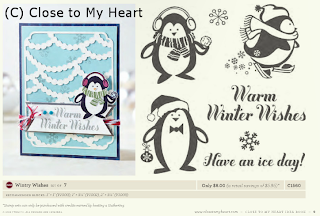 I had Close to My Heart Stamp Consultant, Sheri, come to teach a holiday card workshop. With the sales from the workshop, I was able to obtain an ultra adorable penguin stamp set that is a hostess set. I just love this set. It is so playful! Plus, with penguins being naturally black and white, there's minimal colouring to do (even none if you prefer!). Have a hard time making masculine cards? Animals are a great non-gender specific way to pull off a card! Easy Peasy! Except for the card base, it's made entirely from scraps. I really like this design and have repeated it a lot lately while playfully digging through my scraps. For the penguin, I coloured the ear muffs and used a sparkle gel pen on the scarf. Took all of 30 seconds! The set comes with a couple of small snowflakes so, if you don't have any snowy paper, you could just stamp your own background strips on white paper. It's just so simple and yet so sweet. Check out the card challenge yourself for your chance to win some CTMH stamps! I've already made a handful of Holiday and Halloween cards for the children at Toronto's Hospital for Sick Kids. This batch will include some notebooks for the parents and a small mix of bookmarks and card kits for the treasure chest from which children can pull gifts after a difficult day of treatments. I've been working on my wedding album this past weekend but these cute stamps have been a distraction for the last few days. Aren't they darling? Here, Claire used a tutorial to create a chevron without a die. I think it turned out really sweet. On these next two, Claire used the tags that already were part of the paper design. She cut around the tags and mounted them as a focal piece on her cards. This technique is a great way to ensure all your design elements co-ordinate with each other. These larger images were also part of the paper collection. Here, Claire made her own backgrounds with some stamps and ink. Overall, it was an adorable set and I am sure it will be entirely used up by SOAR this year! Just a quick post of my hand made get well card. My father-in-law had surgery today. Everything went well, except for the waiting, of course. Waiting is always nerve wracking for the family. He was nestled in to his room around 9pm and fairly alert, so I'm told. I will not see him myself until tomorrow. Here is the card I made for him. The bear stamp and sentiment is from Close to My Heart. The bear set (which is retired) is utterly adorable. I coloured it very simply with two shades of brown copic markers. I composed and wrote a verse inside for him. I hope it will bring him a smile.